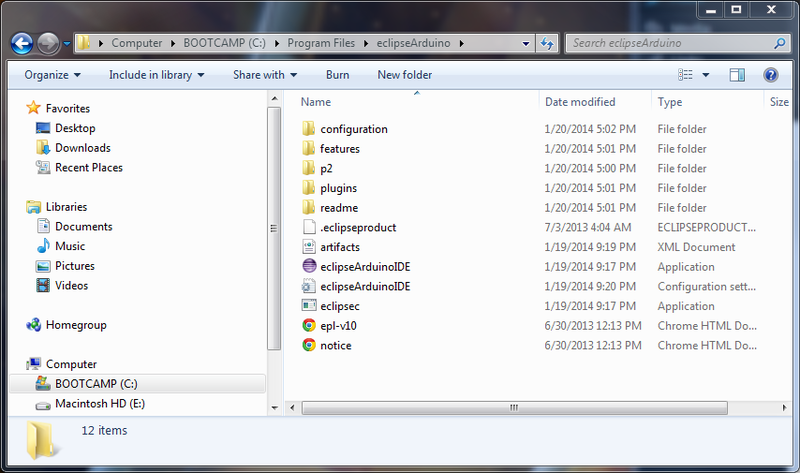 These instructions describe how to install the new Arduino Eclipse IDE using Windows 7. This includes integration of the latest Teensyduino release to allow users to work with Teensy boards, including the newest version Teensy 3 and Teesny 3.1. These instructions were written using Windws 7 – 32-bit but should equivalently apply to Win-7 64-bit. Download the correct installer for your operating system. If you are operating on Win-32 bit, download the 32-bit file, if you’re on Win 64-bit then download the 64-bit file. The downloaded file needs to be uncompressed using, for example 7-Zip. The uncompressed file will have file name ending in .tar. Open this tar.file with the 7-zip file manager and unpack the file. This will create a folder named eclipseArduino. This folder will contain the eclipse executable. 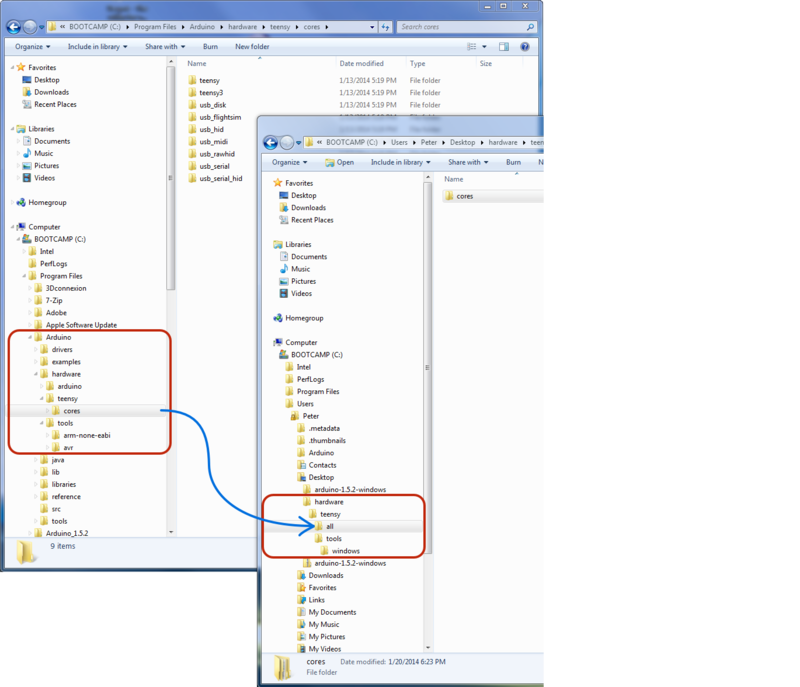 This folder can reside anywhere, but for the purpose of consistency it may be a good idea to place it in C:\Program Files and then make a shortcut to the desktop so it can be started from a convenient location, but again, this is not necessary. If you are not using Teensy boards you can skip ahead to step 10 to set the preferences. 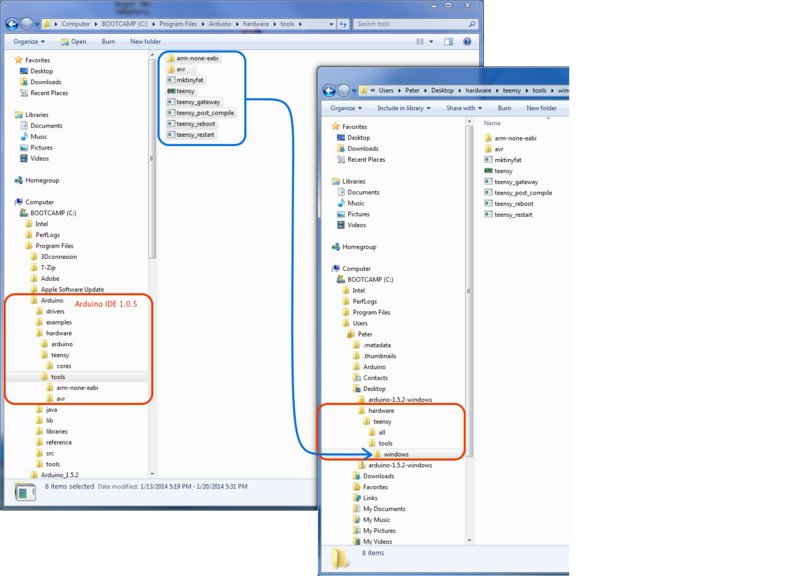 With that said, create a directory structure called hardware with subdirectories as shown in the image below. This folder can reside anywhere, for example on the Desktop as shown below. Following the links highlighted in blue, download the boards.txt and the platform.txt and save them into the .\hardware\teensy\all folder. Clicking on the links will open these files in a new browser window. You will have to select all (CTRL-A) and copy the contents (CTRL-C) and paste them (CTRL-V) into the Notepad editor and save the file with the correct name either boards.txt or platform.txt. The directory where the Arduino IDE 1.5.2 is installed. The hardware directory we created in the previous steps. Done!…wait, there may be one more thing…. If you’ve worked with the previous version of the plugin 2.1.0.4 and want to compile you old projects, before doing so you need to open the properties/Arduino settings for each project and select the correct boards.txt file. My project build did not find my user library or user hardware directories specified in step 10. Also did not find the SPI.h file in the avr directory. I looked at the settings but could not identify anything that referenced my library or hardware directory (other than where I entered it into the preference dialog). Should I add it to the includes path myself? All libraries you intend to use in a given project need be added to the project by highlighting the project in the project explorer and then selecting “Arduino -> Add library to the selected project”. This will open a window with all libraries that are installed either in the Arduino 1.5.2 IDE or that you have in your private libraries folder. There are no libraries in the “hardware” directory, only Teensy specific ARM and AVR tool chains etc. Stuff that’s needed to compile and upload code to the board. Once you have imported the libraries into your project (they are actually Eclipse specific links) you need to use the normal #include in your Sketch to access their functionality. Assuming that you are using Teensy, the process I have described in the instructions does not copy any of the Teensyduino libraries from the Arduino 1.0.5 installation. I personally only copy the ones I use into my private libraries folder and import these into my projects. That way I keep my Arduino 1.5.2 installation clean of any Teensy specific things. Importing/linking libraries in this way is a step you don’t have to do with the Arduino IDE, but it is a huge advantage! It would be helpful if you could provide feedback if that file is really not in that location. I am a little worried about the mixture of forward and backward slashes in that directory link, but maybe that’s not the problem. We’ll see. I know, of course is not there. I followed your tutorial, so I have it as it should be in hardware\teensy\tools…. I have it exactly how is here described, just i have arduino ide 1.5.8 but i tried it also with 1.5.6 but no result. Yes I released too that there is some strange mixture of slashes, but I could not figure out how to make it work. Becuase in Eclipse plugin it is able to compile. I am not at my machine right now but I did notice that “teensy” appears twice in the path. That should not be the case. I’ll look at it in more detail tomorrow. Currently I don’t have access to my computer, but before I can get around to test this myself on a Windows installation, let’s back up for a moment. What windows version are you working with and is it a 32bit or a 64bit version ? Did you download a nightly build (2.4), or did you install the stable version (2.3) ? I am assuming you did not install Eclipse separately and then installed the plugin into Eclipse but that you downloaded and install the product bundle. Please confirm! That information should help me to better identify the problems you are experiencing. I have win64. First I used plugin to eclipse but now use the final product v2.2 64bit. Because 2.3v is still just 32 bit. I had the same problem on Lilinux + My device could not be recognized. It did not know something is connected, but this I think is not problem of the plugin. So right now I figured it out like this: I am using teensy and arduino due. Because arduino due has some bugs in code and I want to use the newest code from 1.5.8 I copied all files from 1.5.8 hardware/arduino to ide 1.5.6 and i keep continue using ide 1.5.6. + ofc I use teensy also with 1.5.6 + 1.2 teensyduino. It works really good accept the error which i described at the beginning. On the new website for the Arduino Eclipse Plugin I can see two links under Install->Stable->Windows. One for 32bit and one for 64bit. Same for the nightly build for Windows. Another little tip that will help the keep the Teensy oriented things separate from the Arduino IDE things. When you create the hardware folder as described in the instructions, what you are copying into it is basically the Teensy cores and the Toolchain for the Teensy boards. That hardware folder does not need to reside inside the Arduino 1.5.x directory structure, but you can locate it anywhere. I find it actually better not to locate it inside the Ardunio IDE because when at some point in time you decide to use a newer, or older version of the Arduino IDE you can keep the Teensyduino stuff separate from the Adruino IDE stuff. Once you get past the installation problems another trap that I have not yet addressed in the instructions is the Teesnyduino libraries. When you install Teenyduino into the Arduino 1.0.6 IDE it replaces many of the libraries with better versions. When I create a Teesny specific project I copy each library needed from the Arduino/Teensyduino library folder into my private library directory and add for example _TD120 to its name so I know exactly where it comes from. This , again, serves to keep the Arduino 1.5.x IDE stuff separate from the Teensy things. Saddly there is nothing to be downloadable from those two links which you posted. When you click on download nothing happens. Thank you for advises, but non of this things does not solve my primary problem. Problems and errors which i described up, does not affect how to code is compiled and how it is running. I don’t care right now If i use ide 1.5.6 (upgrated from 1.5.8 files) when I use eclipse. While I understand your frustrations, with all due respect, I disagree with your assessment that none of the things I suggested apply to the resolution of the problems you are encountering. What I am attempting to do is the eliminate possible sources of interference and to apply good practices that have, worked for me and other folks when working with the plugin. I received these number this morning directly from the main developer. My own upgrade to the newest version required some editions tho the boards.txt to add Teesnyduino 1.21 additions but went uneventful otherwise (Then links to the boards.txt have been updated in the Mac and Windows instructions). You can also try to report your problems in the Thread on the Arduino the Arduino Forum. There are more Windows users that may be able to point you in the correct direction. I created a sub menu item “other resources” on the blog, that contains a link to the Arduino Forum Thread. thank you, you helped me already, I will try to fix everything. Could you please send me link where can I download Teensyduino 1.21 becuase I can find just 1.20. and also you talked about eclipse v2.4, I can not find it neither. I just checked to make sure and you are correct! The latest version of Teensyduino is 1.20. I honestly don’t remember if I donloaded a stable version, or a nightly build. I believe the stable version is 2.3 and the nightly builds are already at. 2.4 level. I am typing this on an iPad and was not aware that the links I posted do not result in downloads. The website is a work in process but already looks much better that what was there before. We’ll just have to be a bit more patient. I’ve offered them my help for documentation and instructions. I’ll try a few things later when I have access to my computer again. You can find the Stable and Nightly builds following THIS LINK. make: *** No rule to make target `C:/Users/Peter’, needed by `T3_blink.elf’. Stop. I am running out of time tonight and may continue to track this down another day. However, the error message above is referring to things way past the error message that you started with. Hopefully you’ll be able to resolve these things. If not, again, the plugin thread on the Arduino Forum is frequented by the developer of the plugin and helps there a lot. I think I know what the doggone problem is. Jantje has mentioned often NOT to put any spaces in the name of folders that are used by the plugin. My user directory is not C:\Users\Peter but C:\Users\Peter Doering. The space between my first and last mane creates the problem. Make sure that there are NO SPACES in any of your Paths. Yes that is really important. I have one separate directory on C:/ where I put all programs sensitive on this kind of mistakes. At the beginning I jot similar error, which I solved with installing cygwin and adding bin directory to environmental variables. Getting this to work on Linux may be easier, however that may depend on the Distribution. The plugin is being developed on Linux so that may help in troubleshooting problems. In general you an also post problems in the thread on the Arduino Forum as I know hat the developer helps out there frequently. When are you presented with that error message . Is this during installation, or when trying to compile a sketch ?